Seabury Hall’s girls cross country team has a high-stakes event coming up, but there should be no doubt that the Spartans made Saturday’s Maui Interscholastic League championship meet a priority as well. “This is so special,” Veronica Winham said after leading a Seabury sweep of the top six spots in intermittent rain at the former site of the Kapalua Village Golf Course. Winham, the defending state champion, had a time of 20 minutes, 22 seconds. 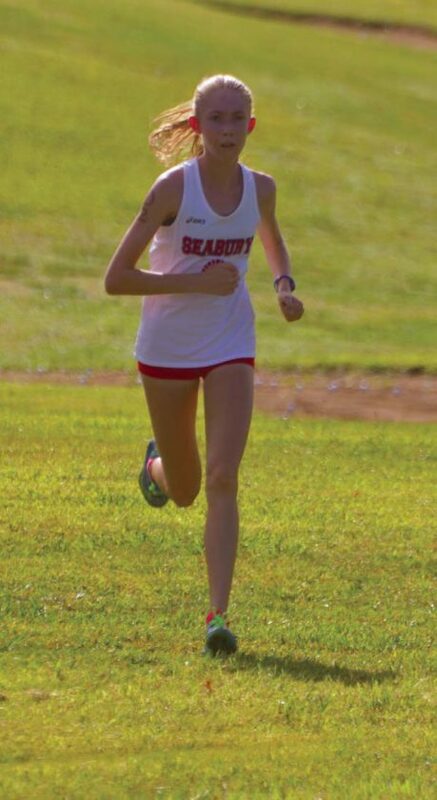 She was followed by Kallalei Ryden (20:25), Darby Mulligan (20:48), Erika Preseault (22:14), Chloe Gangnath (22:41) and Maile Dougherty (22:54). The Spartans’ Bella Lallo finished ninth in 23:44. The Spartans posted a perfect team score of 15 points for the fifth time this season to claim the MIL Division II team championship and a 12th consecutive overall league crown. Winham won all six MIL races she entered this year, and took first place at the Punahou Invitational earlier this month. She was the top Hawaii finisher, second overall, at September’s Iolani Invitational. 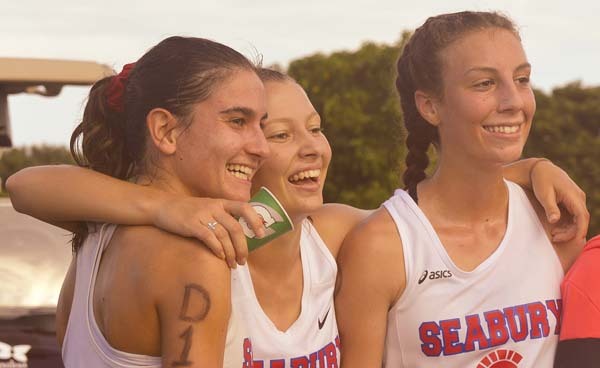 The Seabury girls had been competing as a Division I team this year, but were required to move to D-II in Saturday’s event after a vote by MIL principals, which was needed after an initial vote on the matter by league athletic directors resulted in a tie. The Spartans will race as a D-II team at the state meet next weekend on Kauai. 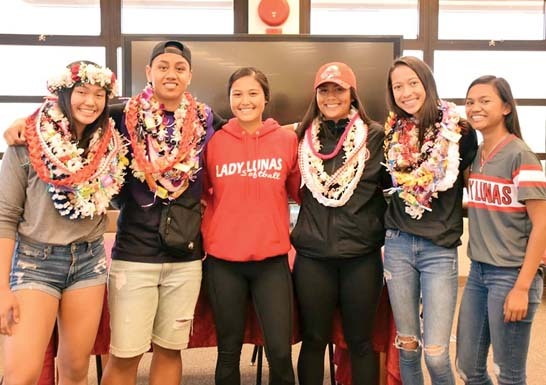 Seabury has won all five of the D-II state team titles since the format was introduced, and claimed the unofficial overall championship last year after posting a better score than D-I winner Punahou. Until the league vote, the Spartans had sought to move to the higher classification to formally create a matchup with the Buffanblu, and the rest of the state’s larger schools. In the MIL boys race, Maui High came close to a top-five sweep of its own in claiming the D-I title and a fourth straight overall league crown with 20 points. The Sabers’ Adam Hakola overcame a fall to finish first in 18:13. Hunter Shields was second in 18:37, Connor Kong (18:53) was fourth and Dinesh Nanthakumar was fifth, another six seconds back. “The tight-knit group that they are has carried over into the races,” said Maui High coach Jared Welch. Hakola, who won his sixth straight MIL race after placing second in the season opener, slipped on one of the wet parts of the course. Baldwin’s Kai Sears (18:51), last year’s champion, finished third. King Kekaulike won the MIL girls D-I team championship with 84 points, 18 better than second-place Maui High. Skyler Sands was Na Alii’s top finisher, placing 10th in 24:03. Maui Prep was the D-II girls runner-up with 107 points. King Kekaulike finished second in the D-I boys competition with 56 points. Seabury took the boys D-II team title with 76 points, led seventh-place Jonathan Merchant (19:09). Molo­kai was the team runner-up with 150 points. Division I–1. King Kekaulike 84, 2. Maui High 102, 3. Baldwin 135, 4. Kamehameha Maui 146. Division II–1. Seabury Hall 15, 2. Maui Prep 107, 3. Lanai 163, 4. Molokai 176. 1. Veronica Winham, Seabury Hall, 20:22; 2. Kallalei Ryden, Seabury Hall, 20:25; 3. Darby Mulligan, Seabury Hall, 20:48; 4. Erika Preseault, Seabury Hall, 22:14; 5. Chloe Gangnath, Seabury Hall, 22:41; 6. Maile Dougherty, Seabury Hall, 22:54; 7. Kalea Acevedo, Lahainaluna, 23:12; 8. Kristi Echiverri, Maui High, 23:30; 9. Bella Lallo, Seabury Hall, 23:44; 10. Skyler Sands, King Kekaulike, 24:03; 11. Kami Echiverri, Maui High, 24:27; 12. Olivia Bozich, Maui Prep, 24:38; 13. Kassie Inouye, Baldwin, 24:42; 14. Linn Huettmeyer, Maui Prep, 24:49; 15. Ale’a Davis, Molokai, 24:58; 16. Kahea Poepoe, Kamehameha Maui, 25:08; 17. Mia Daly, King Kekaulike, 25:10; 18. Julia Knowles, Baldwin, 25:12; 19. Cecelia Buckingham, King Kekaulike, 25:13; 20. Micah Manuel, Lanai, 25:17; 21. Alyson Panglao, King Kekaulike, 25:18; 22. Nyasia Martinez, King Kekaulike, 25:19; 23. Emma De Brum, Lanai, 25:26; 24. Heidi Mahan, Maui Prep, 25:27; 25. Angel Dela Cruz, St. Anthony, 25:31; 26. Allesandra Stankewitz, Maui Prep, 25:32; 27. Raelynn Yoshida, Kamehameha Maui, 25:38; 28. Trinity Fox, Maui High, 25:39; 29. Naomi Takakura, Baldwin, 25:43; 30. Keeya Bicoy, Molokai, 25:44; 31. Sara Salaparuta, Kihei Charter, 25:45; 32. Jules Giron, Maui High, 25:48; 33. Czerena Bayle, Maui High, 26:12; 34. Cassidy Matsuda, Maui High, 26:29; 35. Keely Logan, Kamehameha Maui, 26:42; 36. Lilia Wietecha-Davis, Kamehameha Maui, 26:43; 37. Erin Kobashigawa, Baldwin, 26:44; 38. Celina Romero, Lanai, 27:00; 39. Ashley Nielson, Maui Prep, 27:14; 40. Kaya Dugan, King Kekaulike, 27:29; 41. Jasmine Molina, Lanai, 27:31; 42. Serena Yuen, Maui High, 27:40; 43. Paloma Banto, Maui Prep, 28:02; 44. Kiana Over, Kamehameha Maui, 28:13; 45. Avtalya Glickman, Kihei Charter, 28:14; 46. Cameryn Kahalewai, Molokai, 28:22; 47. Faith Bonacorsi, Kamehameha Maui, 28:26; 48. Alana Morris, Molokai, 28:27; 49. Mindy Kimura, Baldwin, 28:44; 50. Macaleigh Hendricks, Kihei Charter, 28:49; 51. Hailey Knowles, Baldwin, 29:02; 52. Lily Gavagan, Kamehameha Maui, 29:09; 53. Tai-Li Tangatailoa, Molokai, 29:48; 54. Adriana Sanchez, Lanai, 30:28; 55. Kelsey Bicoy, Molokai, 30:39; 56. Mykaela Padron, Baldwin, 30:40; 57. Mallory Go, Molokai, 31:39; 58. Keona Conroy-Humphrey, Lanai, 32:38; 59. Jasmine Conroy-Humphrey, Lanai, 33:42; 60. Sokhafurumoto, St. Anthony, 33:44. Division I–1. Maui High 20, 2. King Kekaulike 56, 3. Baldwin 118, 4. Kamehameha Maui 129. Division II–1. Seabury Hall 76, 2. Molokai 150, 3. Kihei Charter 168, 4. Lanai 211. 1. 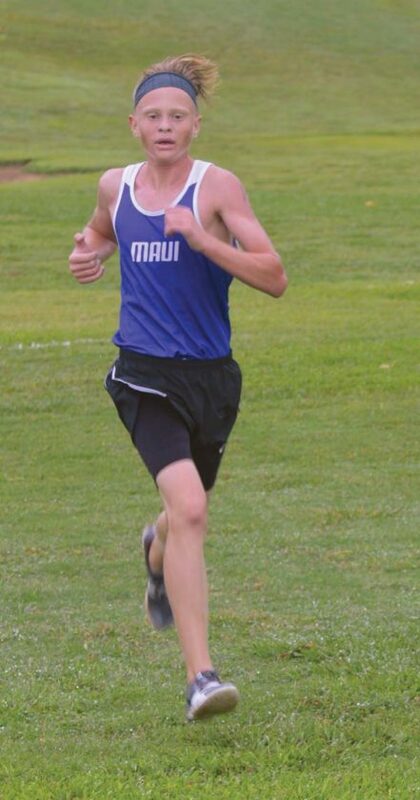 Adam Hakola, Maui High, 18:13; 2. Hunter Shields, Maui High, 18:37; 3. Kai Sears, Baldwin, 18:51; 4. Connor Kong, Maui High, 18:53; 5. Dinesh Nanthakumar, Maui High, 18:59; 6. Damon Wakefield, Maui Prep, 19:08; 7. Jonathan Merchant, Seabury Hall, 19:09; 8. Nicholas Stevenson, King Kekaulike, 19:10; 9. Kawika Fernandez, Maui High, 19:11; 10. Griffin Hardy, King Kekaulike, 19:14; 11. Gian Santiensanio, Kihei Charter, 19:22; 12. Kanai O’Connor, King Kekaulike, 19:33; 13. Louie Smith, Seabury Hall, 19:38; 14. Marcus Kamakaiwi, King Kekaulike, 19:39; 15. Conan Gentil, Seabury Hall, 19:41; 16. Cy Ornellas, Kamehameha Maui, 19:43; 17. Ansel Newman, King Kekaulike, 19:49; 18. Caele Manley, Molokai, 19:53; 19. Kolbe Fontanilla, Baldwin, 19:55; 20. Gabe Frampton, Seabury Hall, 19:58; 21. Forest Blessum, Kihei Charter, 20:00; 22. Joey Musto, King Kekaulike, 20:01; 23. Rylie Shields, Maui High, 20:02; 24. Alexander Fahland, King Kekaulike, 20:05; 25. Richard Haney, Kamehameha Maui, 20:08; 26. Innes Asher, Seabury Hall, 20:12; 27. Jonah Kirkham , Maui Prep, 20:13; 28. Gideon Aiwohi, Kamehameha Maui, 20:14; 29. Cy Tamanaha, Baldwin, 20:15; 30. Micah Ban, Maui High, 20:17; 31. Garrett Smith, Kamehameha Maui, 20:18; 32. Jake Ballesteros, Lanai, 20:22; 33. Rockwell Adolpho, Molokai, 20:38; 34. Robert Mawae, Molokai, 20:59; 35. Diego Deponte, Molokai, 21:04; 36. 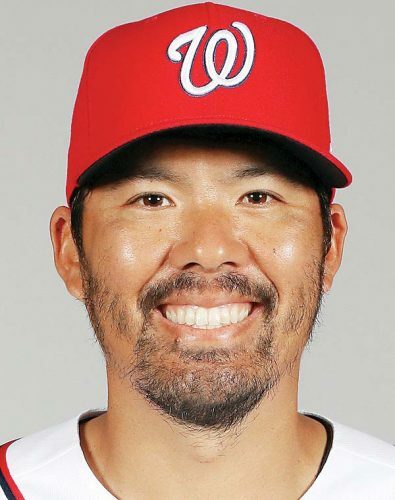 Alex Hamamura, Baldwin, 21:08; 37. Chase Fevella, Kamehameha Maui, 21:09; 38. Nathaniel Cremer, Baldwin, 21:15; 39. Kekumu Helm, Molokai, 21:19; 40. Zack Chmeleck, Kihei Charter, 21:27; 41. Nainoa Kahale, Molokai, 21:43; 42. Darrien Cremer, Baldwin, 21:52; 43. Owen Pendergast, Lahainaluna, 21:53; 44. Mark Key Ambe, Lanai, 22:05; 45. Karter Kester, Molokai, 22:07; 46. Desmond Ige, Lanai, 22:08; 47. 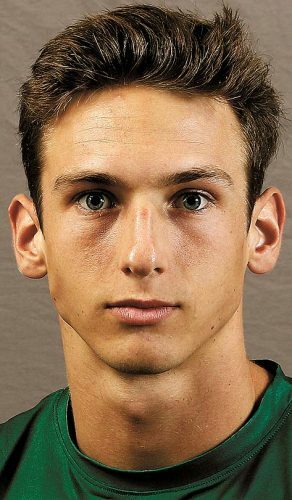 Eddie Omine, Baldwin, 22:09; 48. Pukonakona Patricio, Kamehameha Maui, 22:21; 49. Ethan Gulnac, Seabury Hall, 22:28; 50. Elisha Cullins, Kihei Charter, 22:48; 51. Louis Romero, Lanai, 22:51; 52. Kekoa Catiel, Lanai, 23:17; 53. John Williamson, Kamehameha Maui, 23:20; 54. Daniel Tongson, St. Anthony, 23:22; 55. Jalen Coloma, St. Anthony, 23:24; 56. Mark Brocklehurst, Seabury Hall, 23:30; 57. Kenneth Manuel, Lanai, 23:49; 58. Andrew Lawson, Kihei Charter, 24:08; 59. Christopher Tan, Lanai, 24:17; 60. Pohaku Kepler, Kihei Charter, 24:21; 61. Reymart Galano, Lahainaluna, 24:31; 62. Kendrew Olboc, Kihei Charter, 25:55; 63. Riley Ambrose, St. Anthony, 28:18; 64. Jerone Samari, Maui Prep, 29:33.